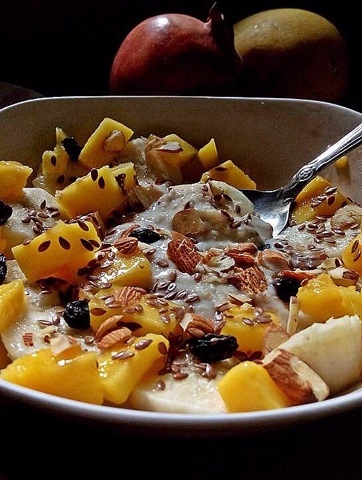 Make your daily bowl of oats more interesting and healthier by adding some flax seeds, nuts and fresh fruit chunks. Breakfast will seem more like a dessert with this fresh healthy start. Kids will love the variation to their daily bowl of oats. Experiment with fresh seasonal fruit, nuts and seeds. 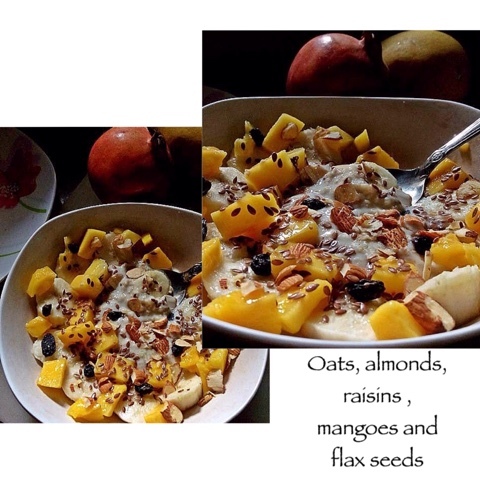 Use a different fruit everyday for a filling breakfast that need not be monotonous. The pics tell all so you will surely need no recipe. Just add some banana slices, mango chunks, a tbsp of flax seeds and almond slivers , with a splash of milk and no added sugar .and you are good to go.